Even Commodore made pong systems ! This one has 4 pads to allow 4 players games! The texts on the systems are both in german and english. MOSTek, another manufacturer well known in the micro computer market, released a quite advanced line of video game chips in 1977: the MPS-7600 series. Rather than integrating the components of a complete PONG game, this type of chip contained some circuits to display graphics and generate sound effects, all of which were driven by a simple processor and a 512-word ROM (Read Only Memory). Four versions of this chip are known to exist. Each of them contains customised circuits adapted to the games played. 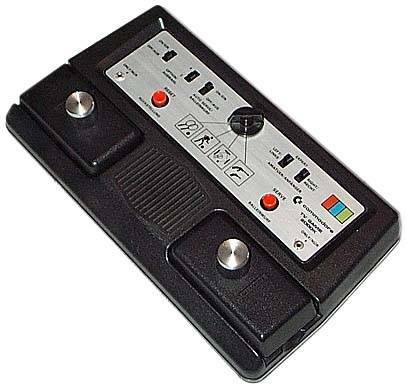 For example, the PONG version (MPS-7600-001) that plays four games for two or four players has some special paddle and ball generators. This particular chip was also released in PAL format as MPS-7601. So far, only Commodore is known to have used it in a system (model 3000H). see more Commodore TV Game 2000K Ebay auctions !